Great hotel, with lush gardens and vegetation, if you are staying a bit longer and want less of a resort/touristy feel. Rooms are modern and some have kitchenettes. The resort is walking distance to a few small grocery stores. The Manava Suite Resort Tahiti offers a superior level of luxury service for both business and leisure travelers, with a unique Polynesian welcome for all our guests. Situated on the west side of the island, Manava Suite Resort Tahiti boasts the largest infinity pool on the island, complete with the popular Taapuna Pool Bar, where a sunset cocktail is the highlight of the day, as the rich reds and oranges light up the ocean and spread spectacularly across the sky. Manava Suite Resort, Tahiti offers a wide selection of 120 luxury rooms and suites to suit every budget, including spacious garden suites and multi-bedroom duplex apartments. Each has been designed by Tahitian architect/designer Bruno Hervochon, to reflect authentic Polynesian decor, and fitted to the very highest standard to ensure your complete comfort and relaxation throughout your stay. The four-star resort includes two friendly bars, a highly rated restaurant serving the finest of Polynesian and international cuisine, a boutique, a fitness center & spa and of course, our famous infinity swimming pool facing the lagoon and nearby island of Moorea. 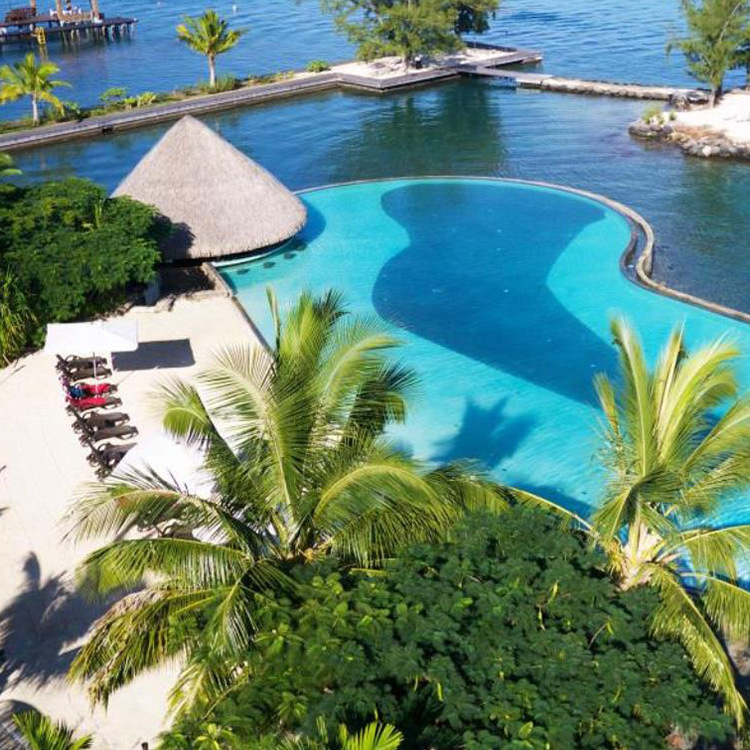 Surrounded by tropical forest, this upscale beachfront resort is 5 km from the underwater views at the Lagoonarium de Tahiti. Plush, island-style rooms come with free Wi-Fi, flat-screen TVs, DVD players and minibars, as well as tea and coffeemakers. Suites add sitting areas with pull-out sofas, along with kitchenettes and private terraces. Upgraded suites feature separate living rooms. Amenities include a chic regional restaurant with a terrace, as well as 2 bars, 1 housed in a thatched-roof hut next to the lagoon-front infinity pool. There’s also a plush spa, a boutique and a gym, while activities such as jet skiing and golfing are offered.